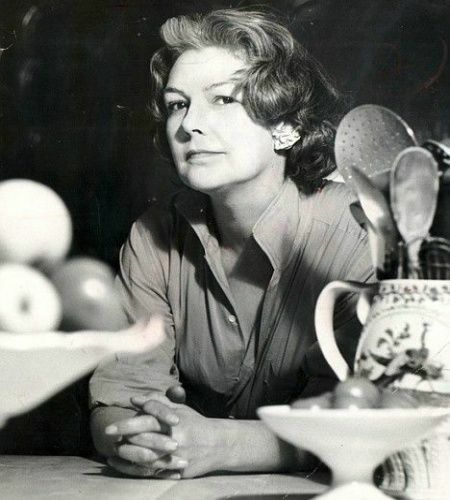 From the kitchen of One Perfect Bite...Elizabeth David was a child of privilege who grew to become a beautiful, adventurous woman. She was a food writer whom many credit with revitalizing home cooking and expanding the horizons of homemakers in Britain. Behind the scenes, her life was the stuff screen writers dream of. As a young woman she studied art in France, and while she failed as an artist, this period of her life introduced her to the glories of the French kitchen. She abandoned art for the theater, but was unsuccessful there as well. Her stage career ended abruptly when she ran off with a much older man and began the first of many adventures that would mark her singular life. The liaison took her through the Mediterranean where her love of food was fueled. She escaped the Nazi invasion of Greece by fleeing to Egypt where her language skills made her a natural for employment with the British government. When the war ended, she returned to England. Wartime rationing was still in effect and she was dismayed by the restrictions it imposed on the British diet. That led her to write a series of articles celebrating the food of the Mediterranean and the ingredients used in its cooking. Her writing sparked the imaginations of her war weary readers and her career as a food writer began. Within ten years of her return home she was a major influence in British cooking. She would go on to write eight books, some of which were autobiographical. She led a remarkable, unconventional life, and while she was purported to be an unpleasant person, she was an extraordinary food writer who introduced the British to olive oil and garlic and the wonders of the Mediterranean kitchen. She's earned her place on the Gourmet Live list of Women Game Changers in Food. Her food, to this day, remains some of the best around. I've chosen a recipe for her flourless chocolate cake to share with you today. It is delicious. 1) Preheat oven to 300 degrees and butter an 8 inch spring-form pan. 2) In a heavy saucepan over low heat, melt 4 ounces bittersweet chocolate with vanilla, espresso and brandy. 3) Add butter, sugar, and ground almonds and heat mixture until the butter is melted. Remove pan from the heat. 4) Beat 3 large egg yolks until they are lemon colored. Stir them into the chocolate mixture. 5) Whip 3 large egg whites until they are just stiff and fold them into the chocolate mixture. 6) Turn batter into prepared pan and bake cake in the middle of the oven for 45 minutes. Cake will have some cracks on top and a tester will not come out clean. Let cake cool completely on a rack and remove side of the pan. 7) Brush with raspberry jelly or whipped cream or powdered sugar. Yield: 8 servings. The following bloggers are also featuring the recipes of Elizabeth David. I hope you'll visit all of them. They are all great cooks who have wonderful blogs. Next week we will highlight the food and recipes of Sheila Lukins and Julee Rosso. It will be really interesting to see what everyone comes up with. If you'd like to join us please email me for additional information. Everyone is welcome. Mary thank you so much for passing by my blog! Your post is so interesting and I'm looking forward for the next! I want this cake... booze, coffee and chocolate. OH YES! I'm inclined to agree with Dzoli, a true artist was Ms David! As I said on Val's post, Elizabeth David is one of the ladies I knew the least about. It never occurred to me about her escaping from the Nazi's, but of course it makes sense now that I read what you've shared. Just think where we would be in terms of healthy and tasty food filled with sunshine of the Mediterranean had it not been for Elizabeth David. Your cake is a perfect example. I keep an Elizabeth David book in my car at all times, it is in there so that I am never without something to read. This cake is perfect. It as everything to makes it perfect: brandy, chocolate and coffee! She's giving me that look like she doesn't quite trust me. Hmmmm. But the chocolate cake is all that matters! I just can't wait to make this cake...and your black and white photo is brilliant! You tell stories in a wonderful way, Mary. I don't bake desserts, but I like reading anything you bring us. Mary, I love how you presented the photo, and this cake does sound wonderfully good! This is such a great series, Mary. And the recipe is gluten-free. Nice. Too bad this lovely lady had a reputation for being unpleasant. How could you be around so much delicious food and be unpleasant? Interesting post you have here. Your black & white pics caught my eyes! Love the background you gave us on Elizabeth. I had no idea she had led such an interesting life! The cake looks and sounds delicious! Just by looking at the ingredients I can tell it's going to be a good chocolate cake! Thanks for introducing Elizabeth David to me. This cake symbolizes Elizabeths lofe to me, seemingly conventional and yet not. Without the flour this would be a gluten free dream!!! Mmmm brandy, chocolate and coffee together sounds amazing!! 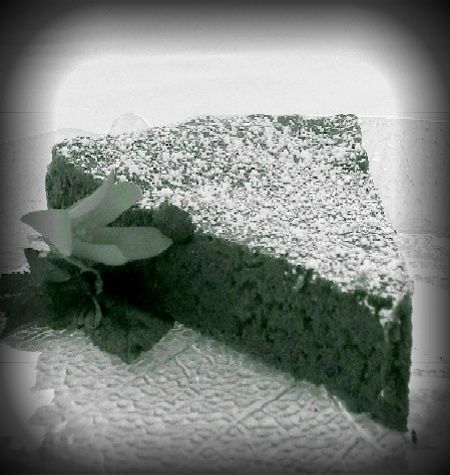 Fantastic black and white photo of a delicious cake! Thanks Mary for stoping by my blog; your kind words mean a lott for me. That was so very interesting. I've seen her picture, and the covers of her books, but really didn't know anything about her. Is there life without garlic and olive oil? I lived probably twenty years without either one. Imagine. Very interesting note. I was not familiar with Elizabeth David or at least had never attributed her name to cooking. My loss, I will have to check out her cookbooks soon. The chocolate cake looks wonderful. I really think that chocolate is the best medicine!! What an interesting post. The recipe looks wonderful. I look forward to reading the next post! Delicious chocolate cake love it.Nice way to honor her. What a great woman to draw inspiration from for a post. Thanks for introducing her to me! This sounds like a great recipe! I make a chocolate cake with espresso in it and it has a wonderful chocolate flavor. Chocolate cake with espresso and brandy and almonds? Count me in! What interesting post! Your blog is very nice!! This chocolate cake sounds great. I like the nuts added to the recipe. Thanks for sharing with us. Wow I never knew the back-story to Elizabeth David's life! It really is the stuff that screenplays are made of! This cake looks delicious. Simple yet utterly satisfying. This is an excellent little biography of Elizabeth David, she was truly inspirational. I, too, have been loving this series and more intimate peeks into the lives of the game-changers. Elizabeth David I find especially intriguing. I must read more about her. And the cake! Just WOW. I feel like my misadventures in career kind of parallel hers. Maybe there's hope for me yet. What a great series! I wonder why she was reported to be an unpleasant woman. Lovely write up on Elizabeth. She is such a fascinating cook and author to me. Love the recipe you chose as well to highlight her. This cake is very Italian, I can really relate to it :-). Mary, in case you or any of your readers are interested i have a blog candy on to win mine and Arantxa's book Party Food for Girls. Basically it is like asking blogger friends to promote it, I guess this is what a blog candy is all about :-), and two small writers from the end of the world cannot compete with the marketing machines of the TV chefs, so why not, I'll try with blogging!!! It is a good book made with love and lots of work, I can personally assure you of that :-). I read one of her books and while I was not overly impressed I did envy her lifestyle; this cake is fabulous, reminding me of a classic one my mother used to make, with only one tablespoon of flour and lots of beaten egg whites. Her cake sounds wonderful! I love how there's coffee and brandy in it! Yum!! What a life! Can't wait for the movie ... but in the meantime I'll content myself with this FAAAAABULOUS cake!! I did not know who Elizabeth David was until this week, so thank you for leading us on this journey to learn about all the great women in food. Love the black and white photo of this decadent cake in honor of Elizabeth David. interesting background on e.david.I would like to check out the rest of the bloggers and see what they made.. This is so classic - thanks for posting! This looks divine! I cannot wait to try this recipe! Thanks for sharing.